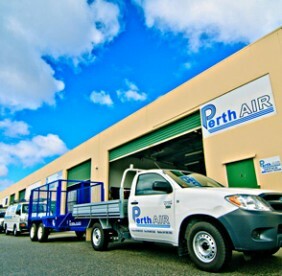 Perth Air is a Western Australian owned family operated business that specialises in the Servicing, Maintenance, Repair, and Commissioning of Air-Conditioning, Refrigeration, and Control Systems. Robert McSweeney established Perth Air in 1994, after many years operating as a sole trader. His aim was to better serve Perth’s residential, commercial and industrial sectors. Today, Perth Air has a well-established client base, and is committed to delivering professional air-conditioning and refrigeration services to residential, commercial and industrial operations throughout the Perth metropolitan area. At Perth Air, we work in partnership with our clients to understand their objectives through effective and frequent communication. We only use quality materials, and provide an exceptionally high standard of workmanship. Our knowledge and experience in air-conditioning and refrigeration systems ensures all servicing, maintenance and repair work is carried out efficiently, with minimal disruption to the workplace. Our regular contract customers also enjoy discounted hourly rates and priority service. We invite you to browse our website to learn more about our services or contact us for further information.